Andy Barraclough explains to his PCEC audience there are four different strains of Dengue Fever in Thailand. He pointed out that if a person has previously contracted one strain, they are not immune to the other three. 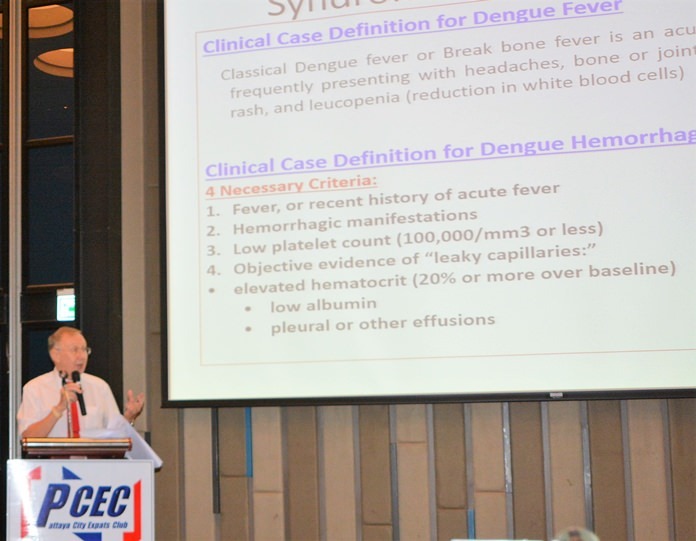 Dengue Fever is a serious disease the Pattaya City Expats Club (PCEC) learned at their August 6 meeting. The presentation by Andy Barraclough also included information on the status of new vaccines against the disease, which affects many in Thailand and other locations around the world. It is a viral disease that is evolving rapidly. Andy is an Emeritus Professor of Public Health and Director of Training at the Empower School of Health. His focus has been the effective management of pharmaceuticals and medical commodities, and the development of new medicines and vaccines for neglected tropical diseases. As Professor at the Empower School of Health, he has authored and presents many World Health Organization Certificate Courses. In his endeavors, he supports various vaccine programs in Africa, South/South-East Asia. 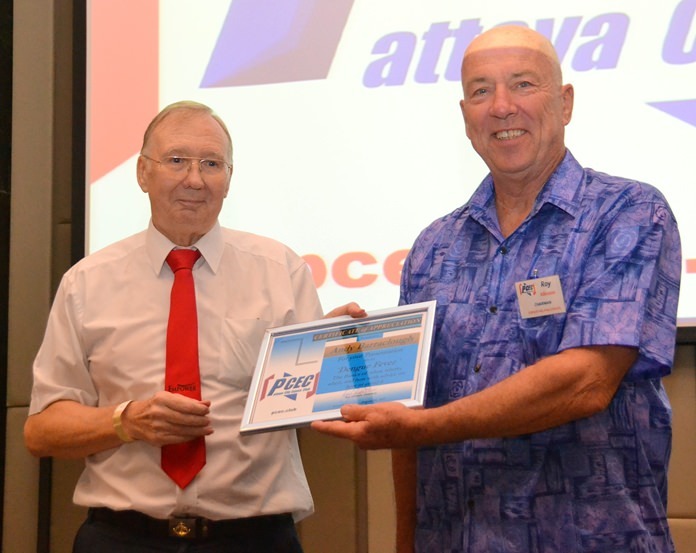 MC Roy Albiston presents Andy Barraclough with the PCEC’s Certificate of Appreciation for his very informative and interesting talk about Dengue Fever; something everyone should know about if they live in Thailand. Andy started the presentation with disclaimers, indicating that he was expressing his own opinions, which may not be the “official policy” and that it was not complete. Most importantly, it must not be considered or used as medical/clinical advice or a recommendation and it is not intended to substitute professional medical advice, diagnosis or treatment. He advises all to seek advice from a physician/qualified health provider and to never disregard professional medical advice or delay care, based on his presentation. A majority of the presentation was extracted from the “Second Asia Dengue Summit” in Manila on 1-2 March 2017. He answers the “What? Where? When? and How? Questions. What? Dengue is a very complicated disease. It is one disease with four syndromes, it is one virus but four serotypes, now maybe five. It is not static; many aspects are changing rapidly and there is limited data. The virus is thought to be connected to Yellow Fever and the vaccine for Yellow Fever is connected to the Dengue vaccine. The virus is delivered into the blood stream by several species of the female Aedes Aegypti Mosquito, AKA “Tiger Mosquito” (w/black/white stripes). Where? Dengue is spreading to North America and in more than 25 European countries, Africa and the Caribbean, due to Tiger Mosquito transplantation by travel and trade. There are about 110 countries where dengue is common. In Thailand, all 77 provinces are affected and estimates from the Bureau of Epidemiology indicate 140,000 cases and 126 dengue related fatalities, were reported in 2016 (Andy feels the number is much greater). When? The history of the disease is not clear but has become a global problem since WWII. The discovery of the mosquito-transmission was documented in the late 1700’s and the viral cause and spread were understood by the early 20th century. The increased spread of the disease is due to the increased locations of the “Tiger Mosquito” throughout the world. 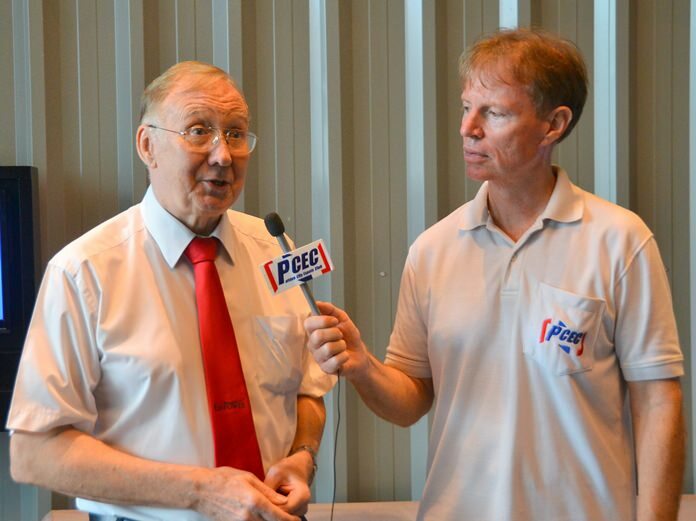 Member Ren Lexander interviews Andy Barraclough after his presentation to the PCEC. To view the interview, visit https://www.youtube.com/watch?v=bLyfYVew4j0. How? The “Tiger Mosquito” transmits the virus, usually in the early morning or evening. It “nibbles” on the victim/victims and can infect with a single bite. Andy points out that the “Tiger Mosquito”, unlike other mosquitos, may bite multiple victims during its daily feeding. The mosquito does not create the virus, it just transmits it. It must first receive the virus from an infected victim, then it takes 8-10 days to reach its salivary glands before it can pass the virus to a “new” victim. Andy also talks about the symptoms of dengue. You may experience a fever that does not go away, even after a few days. You may also experience headaches, muscle and joint pain, skin rash and vomiting. There may be pain behind the eyes and/or swollen glands. The symptoms usually last for 2-7 days. He warns that the disease may appear to go away, but that can be misleading as a patient may develop the much more serious and sometimes fatal Dengue Hemorrhagic Fever or dengue Shock Syndrome. He suggests that you be very careful and follow the advice of your doctor, even if you feel better. A diagnosis of the disease is not always easy. There are rapid diagnostic kits, but they are not very reliable. He also mentioned that there is no specific treatment, but it is important to lessen the fever and keep hydrated. However, he cautions that you should not use aspirin or ibuprofen as they can increase the risk of bleeding. He suggests that you seek medical advice if you experience symptoms of the disease. This is because it could be the hemorrhagic variety which needs medical attention. 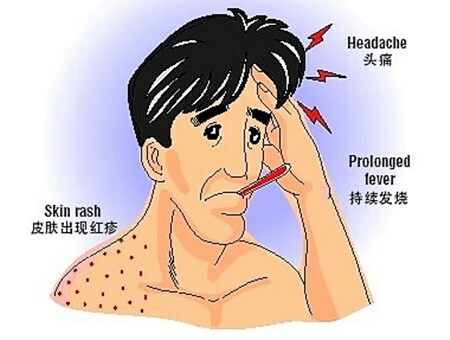 Andy showed some phots evidencing the severe effects of dengue hemorrhagic fever and dengue shock syndrome. He discussed the current status of dengue vaccines. Only one vaccine has been licensed, Dengavaxia, while about five others are in clinical development. Currently, it costs about 3,000 baht per dose and 3 doses are required at 0, 6 and 12 months. Current Thai Clinic Bangkok Guidelines do not recommend the vaccine for travelers visiting Thailand. It is also not recommended for the Expat and is given only to local people who have been here at least 9 years and are not over the age of 45. Andy concluded the presentation by discussing ways to avoid Dengue. About the only sure way is to live in an artic country and do not travel. Otherwise, to kill larva: 1. Turn over all water storage containers. 2. Remove water from flower pots. 3. Clear blocked rain gutters and add BTI insecticides. 4. Cover bamboo pole holders. 5. Drain water in vases and bowls daily. The mosquitoes are attracted to CO2, color, moisture, movement and temperature, avoid what you can. After the presentation, MC Roy Albiston brought everyone up to date on upcoming events. This was followed by the Open Forum portion of the meeting, where questions are asked and answered and comments made about expat living in Thailand. For more information on the Club and their activities, visit www.pcec.club.